Magic Moving Picture Book is a fascinating little book which can make the 7 animals on its pages appear to be moving. 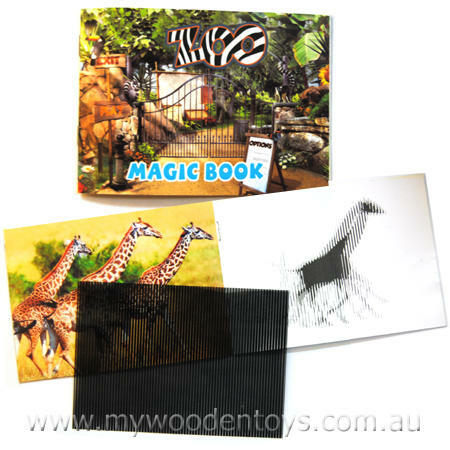 To make the magic happen all you need is the special black and clear lined acetate overlay (provided in the book) to bring the images to life. Slide the acetate over the image and the animal begins to run. Side it the other way and the animal runs backwards. Moving images first appeared in the 19th century as simple optical devices such as the Thaumatrope and the Zoetrope. The process of displaying sequences of still images in rapid succession - to show apparent motion - is the basis of early film animation and motion pictures. We like this because: "wonderful illusion very magical."